Combine a safari adventure across Tanzania's Great Rift Valley with four nights on the tropical island of Zanzibar. We find birdlife around Lake Manyara, ride across the Serengeti to see Africa's 'Big Five' and ramble among primeval baobab trees in Tarangire. We also take a game drive through Ngorongoro, the world's largest volcanic caldera. We then travel to the Indian Ocean beaches of Zanzibar where we can relax on the white sand or snorkel in the clear waters. We can unearth the island's rich history with a Spice Tour and meander through the colourful markets and maze of alleyways in old Stone Town. Serengeti - The most iconic and prolific national park in Africa. Zanzibar - The exotic Spice Island and the charming Stone Town. Great Rift Valley and Olduvai Gorge - Spectacular geological features and the 'Cradle of Mankind'. Ngorongoro Crater - The world's largest complete caldera home to rhino, buffalo and leopard. Tarangire - Herds of elephants and tree climbing lions in baobab dotted plains. Zanzibar - The Spice Island and the narrow streets of Stone Town. Join the group in Arusha, a small town at the foot of Mount Meru. There is time to explore the town independently or to relax by the pool after the long journey before you meet your group. Today we head south-west via Makuyuni to Lake Manyara N. Park for our first game drive. Although there will be some long drives on the tour, the landscape through which we travel and the wildlife we see more than make up for it. Lake Manyara is nestled at the bottom of the Great Rift Valley and for a national park only 330 sq km, of which up to 200 sq km is the lake from which the park receives its name, it is the perfect introduction to a variety of habitats, ecosystems and animals found in Tanzanian parks. The various habitats of the lush forests, the acacia woodlands, the grassy floodplain, the alkaline lake surface and the volcanic peaks are home to prey and predators large and small as well as over 400 species of birds! After our game drive, we head up the Great Rift Valley to absorb the stunning vista that lies before us from our lodge. Please note that drones are not permitted in any Tanzania National Park without a permit, please refer to the equipment section of the trip notes for more information. 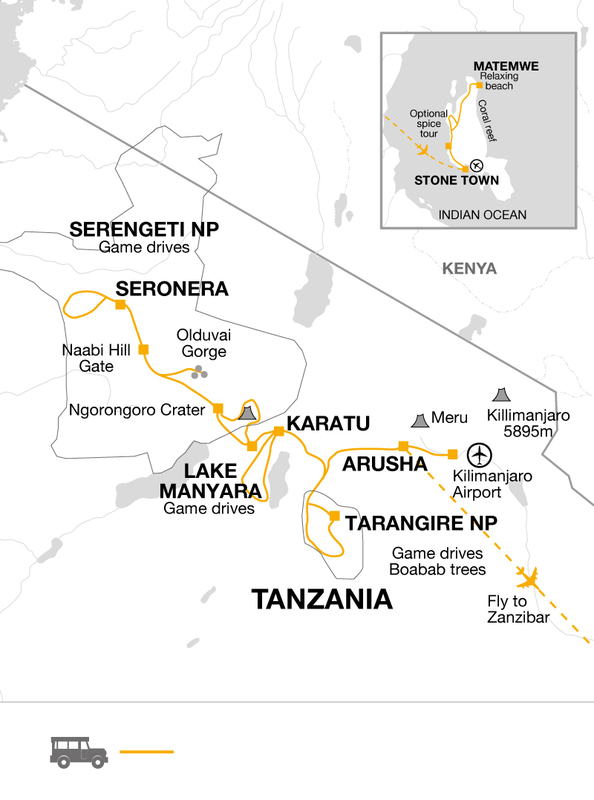 Today we have a long but rewarding journey into the world famous Serengeti National Park. The scenery and views are spectacular as we traverse the Ngoro Ngoro Crater and transit through the Ngoro Ngoro Conservation Area. We pass several Masai homesteads and then arrive at the Olduvai Gorge, where in 1959, anthropologists Dr and Mrs Leakey discovered the remains of an almost intact human skull named 'Nutcracker Man'. It was here at this important prehistoric site, together with other startling discoveries, that have contributed to the furthering understanding of early human development. Olduvai Gorge and the fossils that it contains give a unique insight into the way that this part of the world has changed and humans with it. Accompanied by a local guide we visit Olduvai Gorge visitor centre and museum to learn more of this fascinating place and its secrets. Later today we will enter the Serengeti at Naabi Hill Gate. Serengeti is the Masai name that means the 'endless grass plains' and it is through these plains interspersed with granite outcrops that we travel to our lodge. Once in the Serengeti we'll move slowly through the park, keeping a close eye out for game as we head to the central Seronera area. The Serengeti covers almost 15,000 square km in area and is Tanzania's oldest, and arguably, greatest park. Although the Serengeti is famed for the awe-inspiring spectacle of the annual migration, it still offers some of the best game viewing in Africa. While we are here we shall move through as many different habitats that are part of the Serengeti as possible and seek out the daily drama of the struggle between prey and predator, large and small, from the lions, leopards and cheetahs to the elephants, giraffe and buffalo. Every turn of the game drives reveal something of this stunning world where more than 500 species of birds recorded here! The vastness of the space under the vault of the sky gives one a liberating sense of space difficult to find anywhere else. We'll make one last early morning game drive as we retrace our route back to Naabi Hill and into the Ngoro Ngoro Conservation Area. We will pass various Maasai settlements en route. We then head to the Karatu area where we will stay in a lodge built in the traditional style of an old colonial style farmhouse and nestled in the grounds of a coffee plantation. Today we head back to the crater where we descend from the upper rim, driving down a steep track that drops about a staggering 600m to the grassy plain, lake and marshes of the basin floor below. This winding track is restricted to small 4WD vehicles. Among the animals to watch out for are elephant, lion, cheetah, buffalo and rhino. The perennial marshes teem with birdlife. The crater itself, technically classed as a caldera, owes its existence to the violent fracturing of the Rift Valley over a period of some 15 million years. At one time a volcano occupied this spot that then became extinct and collapsed into the empty magma chamber beneath it leaving only the gigantic natural basin which is now considered a veritable "Garden of Eden". After our half day game drive in the crater today, we return to our lodge in Karatu. This morning we will drive to Tarangire National Park. It derives its name from the Tarangire River that flows through the length of the park. One of the most striking features of the park are the majestic old baobab trees with massive silvery trunks and gourd-like fruit that dominate the skyline. Tarangire has the greatest concentration of wildlife outside of the Serengeti ecosystem and is part of a larger ecosystem that extends further south into the Masai steppes. The permanent water sources of the park attract large herds of elephants and other herbivores to them. The park is home to the shy fringed eared oryx and the gerenuk antelope not seen in other parks. 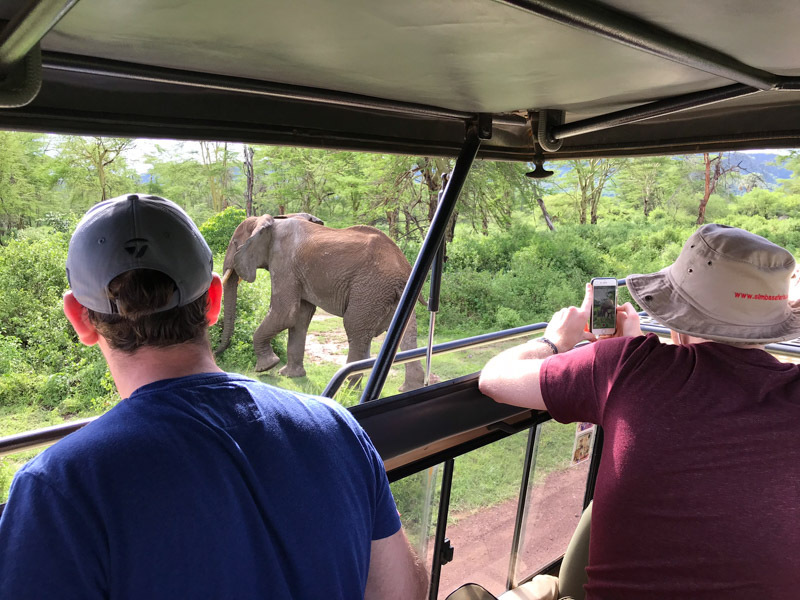 Today we will enjoy an afternoon game drive and then relax and enjoy the wonderful location and views over the escarpment. This morning we will make our way back to Arusha. We will then fly to the spice island of Zanzibar, we head to Matemwe to have a relaxing couple of nights on the coast. Your time is free for personal exploration and relaxation. Spend time watching the fishermen bringing in their catch or go out in one of the dugout canoes with them and try your hand at line fishing. Stroll or cycle along the beach or visit nearby villages. Alternatively, with a mask and snorkel, you can explore the colourful reef offshore, teeming with tropical fish. You may even choose to explore the surrounding area by mountain bike. Scuba diving is available. This morning is left free for you to relax and enjoy your surrounding before transferring to the capital. Stone Town has white washed houses and labyrinth of narrow streets and alleyways. Filled with colourful bazaars and hawkers selling a myriad of goods, and everywhere the atmosphere is permeated with the smell of spices. Today those who wish can take a tour of Stone Town followed by the Spice Island Tour (including lunch) and learn more of Zanzibar's history with a visit to the Sultan's palace where we will see clove plantations established by the Sultan in the 19th century. Explore have been creating award-winning adventures for over 35 years and are experts when it comes to unique travel experiences. Their small group adventure holidays have been running since 1981 and today, Explore are one of the most trusted travel companies in the UK with over 600 trips to more than 130 countries. At Explore, they are passionate about travel and have developed a wide range of unique activities and experiences which gives their customers an unforgettable adventure with a team of award-winning Explore leaders . With Explore, you'll get to see your destination from a whole new perspective that takes you away from the typical well-trodden tourist track. You'll have the chance to meet, dine and stay with local people, rest in authentic accommodation with other like-minded explorers and travel to must-see destinations with a unique Explore twist. From family trips to holidays for solo travellers; cycling tours to wildlife safaris; trekking on mountains or exploring miles of scenic coastline; self-guided holidays or small group trips; there is something for every kind of traveller with Explore. 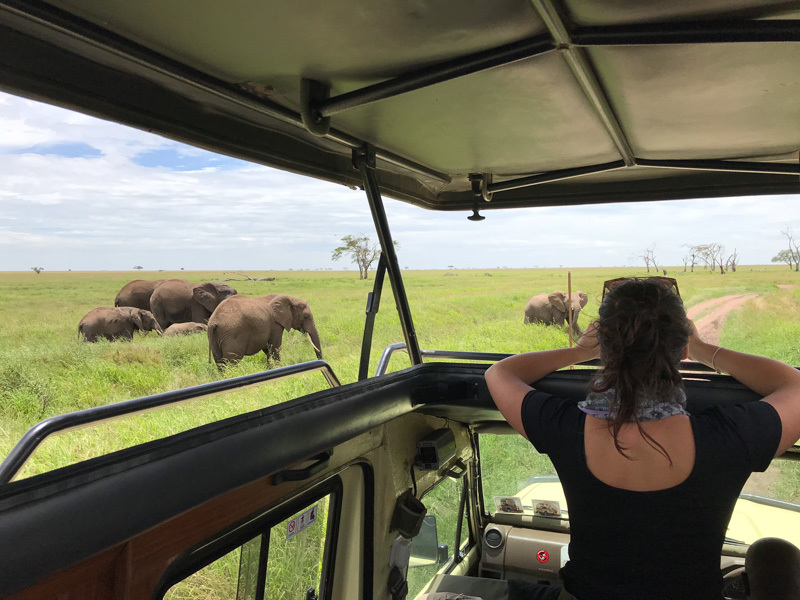 They will provide their expert knowledge, exciting itineraries and outstanding service as part of their sustainable travel experiences which take you under the skin of the country you're visiting for the adventure of a lifetime. This tour is operated by Explore! Visit website Enquire The Adventure Travel Experts!